New painting, new frames and a sunrise. It’s been a busy week! Graham and I have had lots to do organising sponsorship for this year’s Lexden Arts Festival, and putting some better financial arrangements in place. 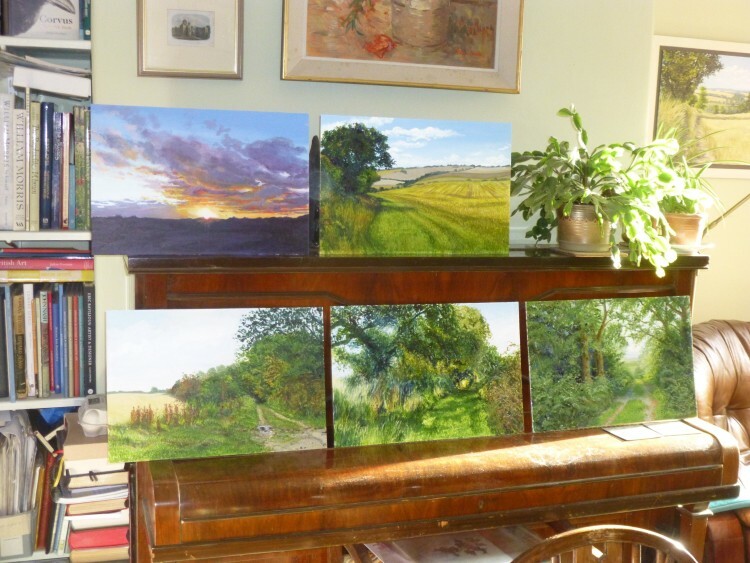 One of my paintings – ‘Summer afternoon on the Colne’ – went off to a new home on Wednesday – and interestingly, the lady who bought it, saw the tiny reproduction of it in the Colchester Open Studios booklet, and tracked it down from there. This really confirmed my opinion that Open Studios is such a worthwhile thing to do. And I’ve finished another painting. 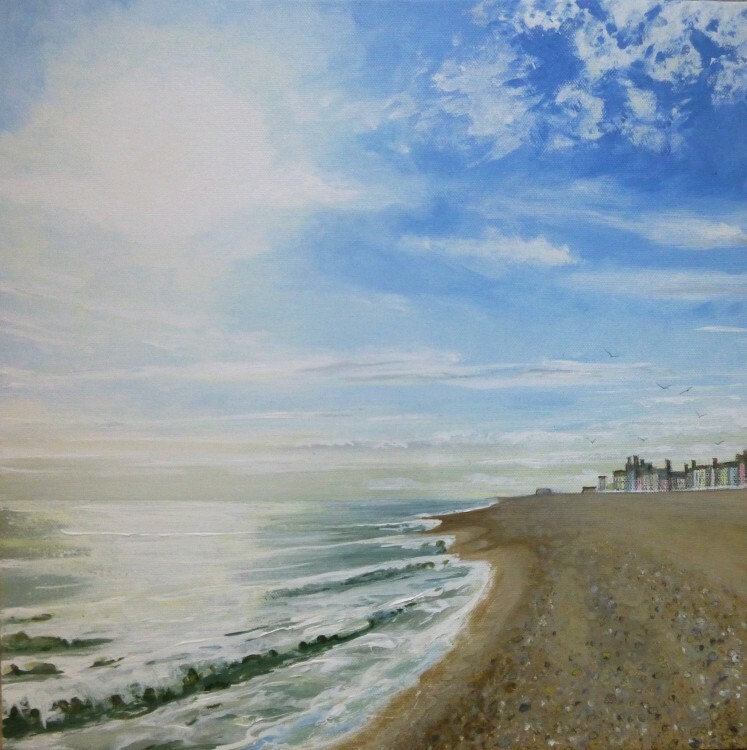 The new one is called ‘Autumn Morning, Aldeburgh’ – a painting resulting from staying in Neptune House in Aldeburgh in early November. It was a lovely bright morning, with the sunlight shining off the sea. This square format is quite unusual for me, but it was good to try it out as I’m actually going to use it for all my Essex Wood paintings. The first batch of square painting boards that I have ordered should be ready to collect this Tuesday – I can’t wait to get started! The large painting each month will be 2 foot square – so larger than usual, too! – and the small ones will be 1 foot square. I thought the square format would suit the feeling I had when walking round the wood of looking up as well as around. I’ve also been considering how to frame the Peddars Way series. They are all such different paintings that it is quite a challenge to think what would suit them all. I propped them all up on the piano last night to consider the matter! So far I have decided to mount them on a charcoal grey board, rather than my usual white, probably, and probably use an oak frame, but not such a wide one as I usually choose, as they are quite small paintings. When I get them to the framers this could all change, though . . . While I’m waiting to start my first Essex Wood painting, I have made a start today on a painting of the willow trees in the Colne valley on the outskirts of West Bergholt, which is from some drawings I did last September. Lovely blue sky and pale, graceful trees . 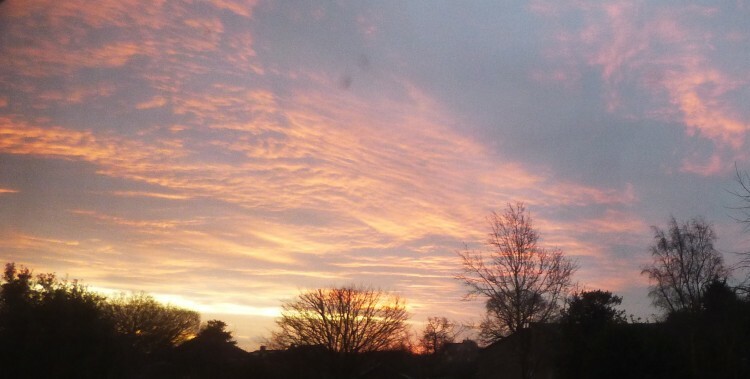 . .
And finally, here is a lovely January sunrise, taken from my spare room window one morning this last week.